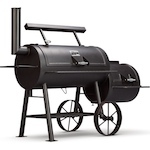 Yoder Smokers Community Forum • View topic - Holiday...smoked Turkey ? so, the holidays are coming and thought I'd do a practice run on a small turkey. 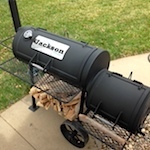 Never done one before so I went to smokingpit.com to take a look at their maple injected recipe. Before I give it a go thought 's ask if anyone wants to share their recipe for a comparison. Please let me know temps also and thanks in advance. I like to season the bird with Kosher salt, fresh cracked black pepper, thyme, garlic and sage. I'll cook it low for an hour or two to get some smoke, then crank it up to 350* to get the skin to cook and the bird to get a nice color. If the bird has the color I'm looking for but isn't done, I'll coat it with butter and wrap in foil. I cook the bird until it is 160* IT in the middle of the beast and 175* in the middle of the thigh making sure I'm not touching bone. Then I will rest it for 30 minutes to allow it to come fully up to temp and let the juices redistribute. After the rest I'll carve off the drumstick and thigh and wing. Then I slice the breast from the carcass and slice the breast across the muscle. Then, of course I take the carcass and peel off any meat left with my hands and make a nice little pile of super juicy, tender and flavorful meat and eat that as the chef's treat. This always makes a nice juicy and tender bird with a little smoke. It tastes like turkey should taste in my opinion with just some basic seasonings, and not a heavy rub. Thanks guys. Because of time restraints (meaning I have to leave for at least two hours), I will probably have to go with a low and slow method. Usually I prefer crispy skin and would lean to a higher temp. I also am leaning to an injection for added tenderness. So, in the end it's probably going to be an hour at about 190 to smoke, followed by a couple hours at 225 (while gone) or so, then after checking will probably rise to the 325-350 until done. I too like poultry to taste lie poultry so while the injection maybe fairly standard (butter ,seasonings and maybe a little beer from Belgium), the outside will stay traditional. 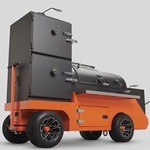 The Yoder pellet cookers are designed to provide the same amount of smoke no matter what temperature that you cook at. Cooking at 190 degrees will give the meat the same amount of smoke as it does at 275 degrees, over the same period of time. The only difference that the temperature settings make, is how long it takes to cook the meat. BTW - I always spatchcock birds of any type. As a test last year, for someone interested in the "look" more than the "lets eat", I spatchcocked a turkey but didn't flatten it out. I set it in the cooker so that it looked like it wasn't spachcocked. It did cook more like a spatchcocked bird, but when it was done, and sitting on the platter, you couldn't tell. Injection should have no effect on tenderness, just adding flavor. Yep Herb I agree. I would have spatchcocked the bird if not for the fact that I will be gone for at least 2 hours. Rather cook slow and not take the chance that the bird is done before I am ready. As far as the tenderness Kirby...I feel the added butter and beer will give a little more juiceyness to the turkey thus keeping it tender. I do know that many go back and forth on the virtues of injection and I too do not inject too often. Thanks for the response and thoughts from both of you. Either way the bird goes in in the next half hour or so. Tried my first attempt at a test turkey for thanksgiving.... 14 pound fresh killed bird. Injected with the butter, apple cider, garlic powder mix. Did a light rub and a few apple juice squirts while cooking. Stuffed some bell peppers and celery inside. Smoked at 275 for about 7 hours. Internal temperature on the breast was 172. Let it sit for 20 minutes. Flavor was good, but meat was dry and a bit on the tough side.... Both the light and dark meat. Also if I cook two birds for Thanksgiving will the cooking time be extended verses one? If so..... Any idea how much longer? Any reason a fresh killed bird might no be as juicy? Diverreb1 wrote: Tried my first attempt at a test turkey for thanksgiving.... 14 pound fresh killed bird. Injected with the butter, apple cider, garlic powder mix. Did a light rub and a few apple juice squirts while cooking. Stuffed some bell peppers and celery inside. Smoked at 275 for about 7 hours. Internal temperature on the breast was 172. Let it sit for 20 minutes. Sounds like you're mostly doing it right. Next time try pulling the bird around 155ºF-160ºF. The temp will continue to rise to the recommended 165ºF. Also, make sure that after you pull the bird it's not too tightly wrapped/contained, or it will continue to cook. Cover loosely with foil. And yes, if you add another bird, allow for another couple of hours, just in case. Good luck! Let us know how it works out. After a few other tests settled on Spatchcocking and Brining for 16 Hours, washing, drying, letting it sit dry in the Fridge for 4 more hours. Then Olive Oiled and a light rub. Bigger bird in the bottom of the 640 and smaller one on the shelf. 250 for an hour then up to 330 til the hit close to 160. Loosely tented for about 20 minutes and carved. They were amazing! For me it will be the new standard.